English country cottages bring to mind pastoral scenes set in the gently rolling green hills and meadows of the English countryside with a bountiful victory garden just outside the kitchen door. 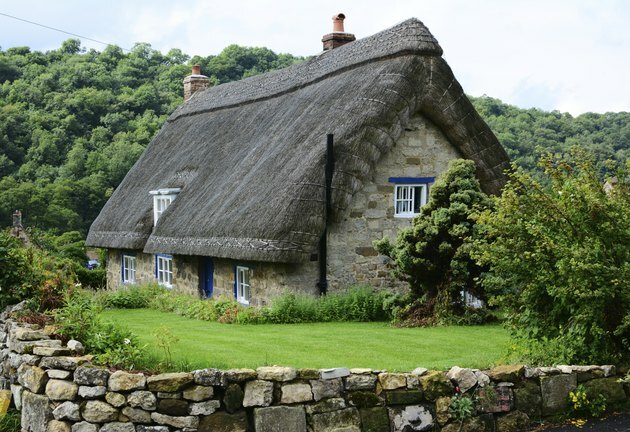 Many of the cottages in England are centuries old with different looks: the classic storybook cottage with thatch rounded peaked roofs, the stacked-stone cottage, the timber-and-stone framed bungalow, and homes with brick or stucco-faced exteriors. Whether refurbished for a modern look or retrofitted as a charming and timeless bucolic cottage, choose a color scheme that creates a sense of tranquility and welcomes the sun. A cottage in the English countryside. A couple relaxing next to a fireplace. 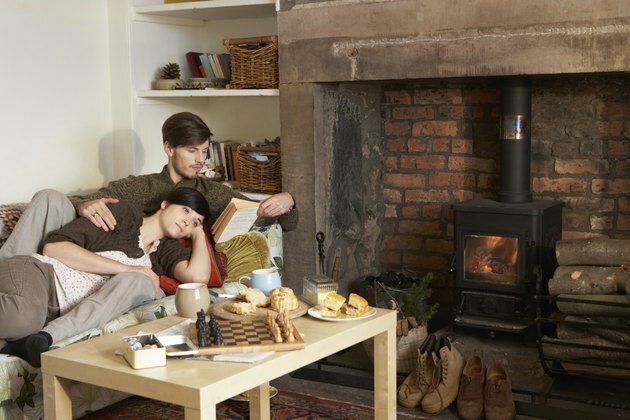 You probably won't find an old without a fireplace in the living room -- and bedrooms as well -- as that was the only source of heat when the cottage was built. The fireplace becomes a focal point and an area around which you can build a conversation nook. Frame out the fireplace in maple, hickory or oak timbers and add maple faux beams to the ceiling for a distinctively cottage feel. Paint the walls in a pastoral hue: soft green, pale yellow or gray-brown. Create a mismatched look with two overstuffed chairs catty-cornered to each other across from a Victorian-era couch or replica with an oversized ottoman between them to hold the afternoon tea tray. Add chintz curtains in a color that matches the walls. Pots hanging from a rack. In the kitchen or scullery area, install a rack over the kitchen counter area or deep farmhouse sink that holds plates, doubling as storage and decor. Old Delft tiles behind the sink add character, color and a sense of history. If you have enough space, add a worktable or freestanding kitchen island that offers storage beneath and a small breakfast bar on its other side. Pale, almost white gray, light muted blue or buttercream yellow are all good color choices for the cottage kitchen. A fabric valance atop the windows, Roman shades or paned windows without treatments -- especially if they look on to a private backyard -- all pay homage to the decor style. 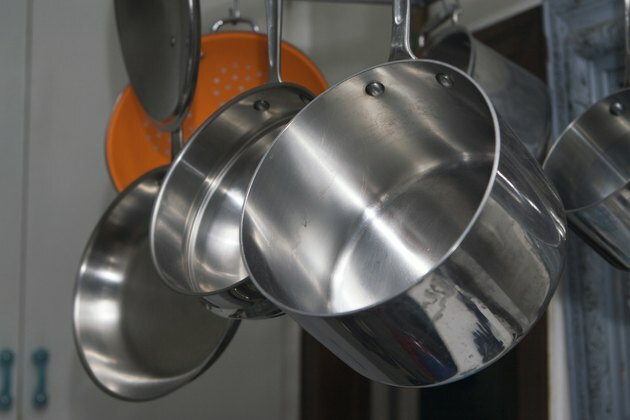 Hang a pot rack above the kitchen island for freeing up needed cupboard space or arrange them artistically on the wall from wall or stud-anchored hooks. Nothing quite says an English cottage bedroom than an antique white metal queen bed covered by a thick feather mattress topper, white percale sheets and white pillows hemmed in lace. A bed meant for snuggling into during those cold winter nights has a warm woolen blanket covered by a fluffy chintz or floral comforter against a white background. Slant framed artwork pieces against the wall on the mantel above the fireplace, real or faux, and include a wingback chair and floor lamp for reading your favorite novels in an opposite corner of the room. 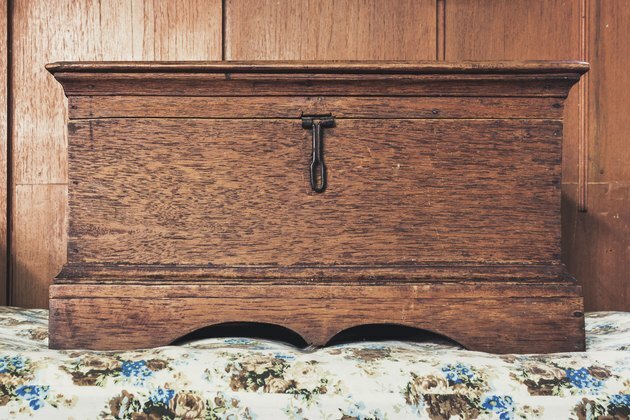 A wood bench or hope chest at the end of the bed holds extra throw blankets for those chilly nights. In place of nightstands, add two shabby chic console muted tables on either side of the bed topped with table lamps and white fringed lampshades. Cover the with an abundance of thick rugs underfoot. Many old English country cottages don't have fancy flooring, with planked wood or stone cobbles covering the floor instead. In the bathroom, paint rugs onto the old planks of wood in bright hues or a monochromatic scheme. 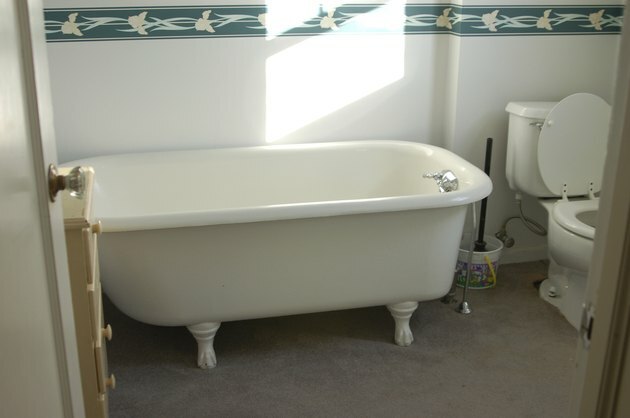 Include a soaking tub large enough for two and a toilet with the tank high on the wall and a long pull chain for flushing. For the bathroom outfitted with a claw-foot tub, add a ceiling-mounted shower curtain oval and plumbing for a shower to the end of the tub atop existing fixtures. Stick to color schemes in cool hues, off-white, the palest of blues or cream. Make window curtains light and airy out of lace or sheers.